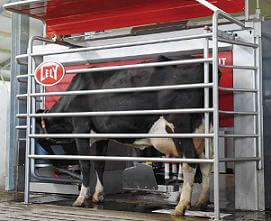 Lely's automated stalls let cows choose when to enter and be milked. When dairy farms decide to outsource the decision making process for milking times to cows, I’m not sure the cows really care. But farmers should. What Lely is doing is putting machines between humans and livestock. Imagine a farm where humans only have to visit once a week to check in on how things are going. That farm already exists in Brittany in France. Lely recently invited thousands to come see a model dairy farm that had robots handling all levels of production and where humans were only present on Sundays so as to comply with French law. The dairy farm (which makes cheese) has 180 cows, but only three farmers. Clearly Lely is selling the machine buffer between humans and cattle as good for both biological parties. Humans don’t have to work as hard, and cows get to move around more freely. I don’t think any system that uses advanced robotics should be called “the natural way of milking” but I do think Lely is on to something. Whether or not cows prefer the robotic systems, the Astronaut A4 certainly seems more animal friendly. Which means that it can be sold not merely as a more efficient but also as a morally superior means of farming. I’m not sure robotics has been able to claim that ground in any other field. While I find some of Lely’s advertising preposterous, I am also rather drawn to it. In a world where industrial agriculture routinely isolates, mutilates, and chemically modifies livestock, the concept of a robotically fueled farm-topia full of happy cows is definitely appealing. The efficiency is really the most important part of robotic agriculture, but the animal friendly attitude is an awesome fringe benefit. Now, if you’ll excuse me, I need to go write down the billion ‘teat detection system’ jokes I wasn’t able to include here.